If you don’t preserve food when it’s in season, you generally have to rely on grocery store, out-of-season produce that was shipped from far away. By canning local or homegrown foods when they’re in season and at the peak of their nutrition and flavor, you can enjoy those foods through winter. This is a smart choice for personal and environmental health. 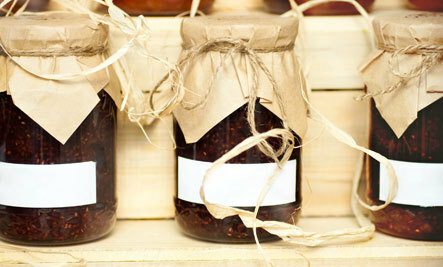 By canning your own foods, you know exactly what you’re adding to those jars. Foods from the store—whether processed foods or commercially canned foods—can contain a whole host of additives, from artificial colorings and flavorings to loads of added salt. If you do like using canned foods in your kitchen, note that most of those metal cans at the grocery store have a liner inside the cans that contains a controversial chemical called BPA. Tests show that BPA—because it is in constant contact with the foods in the cans—does leach into the foods. Tons of evidence shows that BPA is a dangerous and potent endocrine disruptor linked to several serious conditions. Get a basic water-bath canner—new or used—some jars and lids, and a few other simple utensils, and you’re all set to start the process of home canning. Myself and many of my friends love having summer canning parties during which, together, we can chat, laugh, listen to music, and share fresh produce. Canning can easily become a way to connect with friends or neighbors. A lot about our modern food system is isolated—consumers are almost completely isolated from growers and food processors. Growing your own food—or getting it directly from a farmer at a local farmers market—and canning it with friends breaks down such isolation and creates more meaningful connections. I just finished reading the Northwest Edible Life blog about the All American Canner. It was very interesting and many writers wrote tips that you definitely need, but never see in the instruction booklet. I learned with a pressure canner, there is virtually nothing that cannot be canned-spaghetti with meat sauc, stock, pork, beef and chicken. Also ALL vegetables including baked beans, chili, etc. Anything you see in a can on a shelf in a grocery store can be home canned sans the BPA. I personally am still intimidated by the process, but I am working on it. If you do get a canner, never choose the water bath one even if you only plan on making jams. A large pasta pot would work as well and the strainer(comes with the pot) makes a better shelf for the jars than a cheap set up with a water bath canner. "they are usually thin steel granite ware pots which are not good for any other cooking activity except tamales. Burning and scorching is their strong suit." Even if you get a cheapy pressure canner (All American's are about 300.00 dollars-for the very large capacity one-30 qt.) like Presto, you will be better off and would be able to do more with it. Always brings back wonderful memories in the kitchen after harvest, can't wait to do it again. You cannot can vegetables with a water bath canner. I bought a pressure canner this spring . canning can be fun; i tried it once a couple of summers ago. but boy it was quite the ordeal! for starters, my stove has just one large burner. also, my kitchen isn't very big. my entire kitchen was trashed and it was hot as hell when we were done canning. the outcome was only 12 jars of tomatoes! Recent scientific evidence indicates that GM/ GMO crops are covertly being used in many food products, and they are contaminating our food supplies. So far, the most harmful element is the glyphosate used in Monsanto's herbicide Roundup produced to help grow GM/ GMO crops. The glyphosate is taken-up by plants/ crops and is believed to cause sterility in females when consumed. Since the food companies are not required to have labels showing their food products contain GM/ GMO crops, you do not know if the food you buy is safe. I suggest indoor food production 24/7/365 using sunlight tubes, grow-beds and micro-drip irrigation. Thus, you will have enough foods to eat fresh veggies (or whatever) and can, freeze or dry the surplus to create your own organic food reserve. The biotech companies, like Monsanto, are using "political payola" (bribes) to persuade our elected representatives to help keep the public "in-the-dark" about what is in our commercial foods ... but so far, they can yet to make growing and preserving your own foods illegal. Best season to start is now and I love it, thanks for the post! Amanda S, Now, if you will, do it again, take notes and when your friends look at you with that strange look of disbelief, laugh and ask them to join you the next time. Laura S, There is never any better time than the present, dip your toe back into the waters, take back the small, but eventful task that, at the end of the day is yours...yours to share with others. Nola g, Let no one ever tell you, it is a small thing, yet, with time, it is and it can be some of the hardest work that you will ever LOVE. Oh, by the way, my wife and I have canned for over 30 years, and still do; the hardest work we have ever come to LOVE.